This app has been removed temporarily from the iTunes app store in preparation for Little Brown’s hardcover edition, out this august, pre-order here! 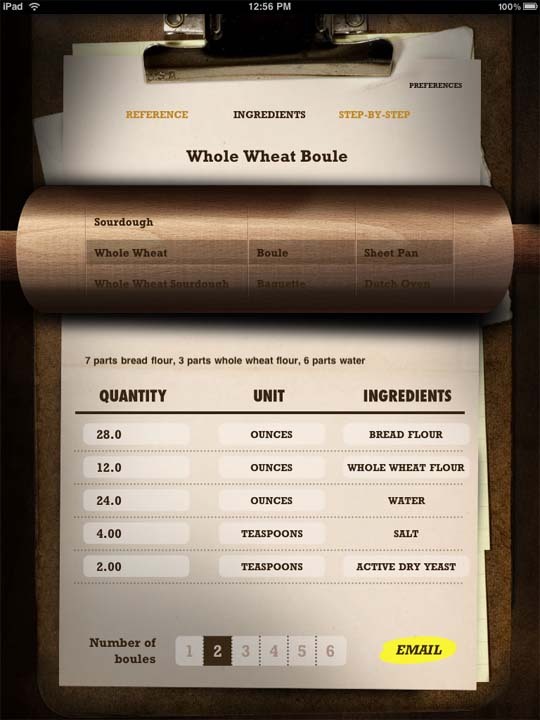 May 24, 2011: Bread Baking Basics App is released for iPhone & iTouch! 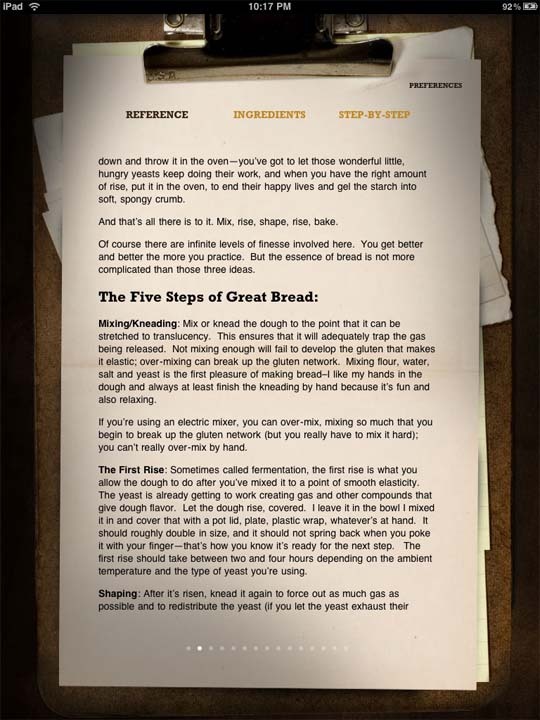 February 1, 2011: Bread Baking Basics App is released! Our new Bread Baking Basics has arrived in the iTunes store: http://bit.ly/breadbaking ($1.99). It’a full-throttle application for iPad with personalized recipes for all kinds of bread—white, sourdough, whole wheat, whole wheat sourdough, rye, rye sourdough, multi-grain and multigrain sourdough, ciabattas, baguettes, boules, loafs, and pizza dough. Just tell it how you mix your dough (with a mixer or by hand), how you want to measure ingredients (ounces, grams, or cups) and all recipes will be generated in that format. To bake bread, choose the type of bread you want, the shape, the baking surface and how much you want, and it will generate a personalized recipe for you and your kitchen with step-by-step instructions and photos. 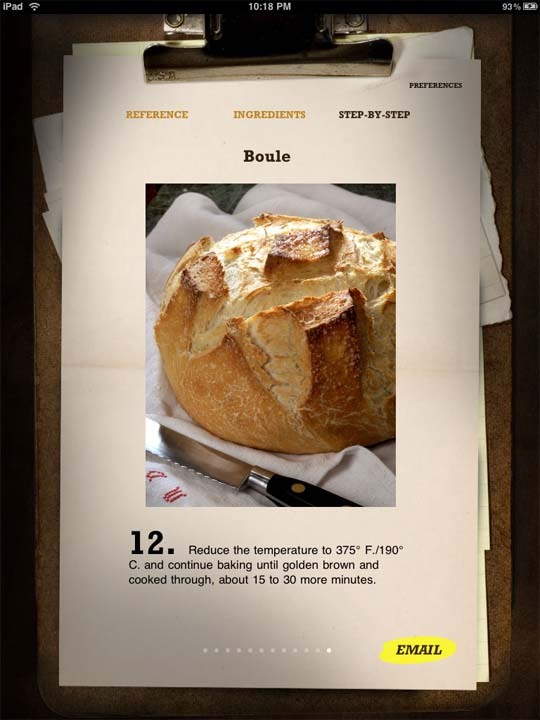 The recipe generator page calculates amounts of ingredients based on how much bread you want to bake. If you want measurements in grams, just click preferences and select “Metric.” If you only have 10 ounces of whole wheat flour, you can change the quantity in the example above from 12 to 10 and the other ingredients will adjust automatically. Each recipe has a step-by-step illustrated guide to that particular bread and shape, what it looks like when it’s risen, how to shape the dough for a boule, for a loaf, for a baguette. The email feature allows you to send or share specific recipes with friends as well as to print a specific recipe. And the handy reference section spells out all the basics you need to bake great bread at home, with notes on technique, ingredients, grains, and various tools. We want more people to bake bread, because life is better when we do. We’re therefore offering this app for what we hope is an eminently reasonable $1.99. Let us know how you like it and if you run into any bugs or problems or have any TECH SUPPORT needs, let us know at apps@ruhlman.com. The best-selling cookbook, Ratio: The Simple Codes Behind the Craft of Everyday Cooking, by me, Michael Ruhlman, is now an iPhone app that will help you calculate amounts of ingredients in all the fundamental culinary preparations. When you know a ratio, you don’t know a recipe, you know 1,000. And this application does all the calculating for you. –THE 32 CRITICAL RATIOS that form the backbone of the culinary arts, with instructions: doughs, batters, meat preparations, custards, sauces (pasta dough and pizza dough, sponge cake and pancakes, fritters and crepes, stocks and sauces, crème caramel and chocolate sauce. –A CALCULATOR that figures out how much of each ingredient you need, no matter how many or how few people you want to serve. –An OUNCES-TO-GRAMS CONVERTER (ratios work no matter what unit you choose to use!). –DELICIOUS VARIATIONS FOR RECIPES on all the ratios, ideas for the creation of new dishes according to your tastes. –An easy way to STORE YOUR OWN RECIPES and notes that you’ve created from the basic ratios. –Quick fun ways to SHARE what you’re cooking with your fellow cooks, on Facebook and on Twitter. –Ratios is also a great way to understand and TWEAK YOUR OWN RECIPES, to help you make your pancakes even fluffier, your pizza dough crisper, your crème brulee richer.